Blood bank has stock sufficient for just a week; hospital needs 20 to 25 units per day. VIJAYAWADA: With the city experiencing sweltering heat right in April, the blood bank of Vijayawada Government General Hospital may soon run dry, with the current stock sufficient for just a week. The hospital authorities are failing to keep up with the splurge in demand. According to sources, though the blood bank has a storage capacity of around 1,000 blood units, it does not store more than 250 at any given time; at present, there are only 190 units available. With around 20-25 units being used every day, shortage of blood at the city GGH is imminent in the face of lack of blood donations. Contrary to the authorities’ hopes of large-scale donations during elections (as political leaders had organised blood donation drives), the outcome was far from the expected lines. 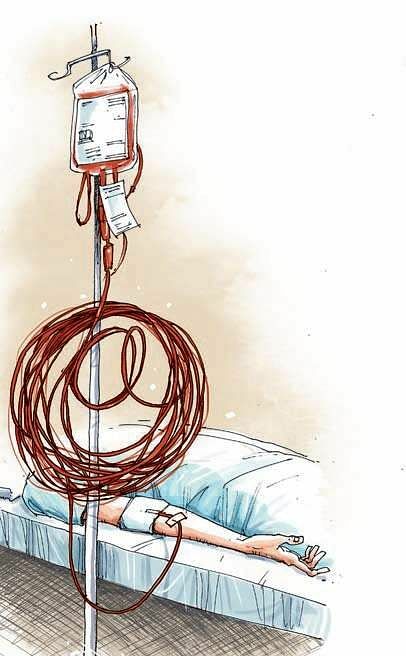 Even the National AIDS Control Organisation supported blood banks, which are supposed to give 30 per cent of blood they collect through drives to government hospitals, are not of much help. There are four such centres in Vijayawada, one in Gudivada and two in Machilipatnam that are partly funded by District AIDS Control Society. It is only the Red Cross Society, which donated 97 units, and Lion Blood Bank, which donated 45 units, that came forward to the GGH’s assistance. Upon request, NTR Trust Guntur and RIMS, Ongole gave 60 and 50 units respectively to the hospital. With a severe shortage of blood donors, the gap between supply and demand has been widening for the past few days. If the situation persists, even surgeries would be required to be put on hold until the flow regularises. On an average, around 100-120 surgeries are conducted every day in the city and, in 90 per cent of the cases, blood transfusion is required. In some extreme ones, as many as 15 units of blood are also required.